As an aside to the performance, for those who might be worried that we are offering an equal weight S&P 500 fund or the like. The Conservative and Growth portfolios each comprise of ten stocks, and 100 shares invested in each of those stocks would result in a total account value of $42,370 and $106,709 respectively. The trading portfolio is made up of five stocks and 100 shares invested in each of them would be worth $30,214 today. To sign up follow the Newsletter links at the left or click here. Below we present the stocks in the S&P 500 that are the most overbought, or most oversold versus their last 200 days of trading. 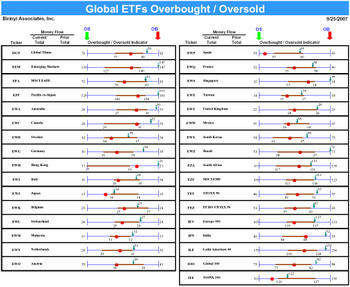 MOT and EMC for example, are the most overbought they have been, while SHW has been more oversold on three other days. 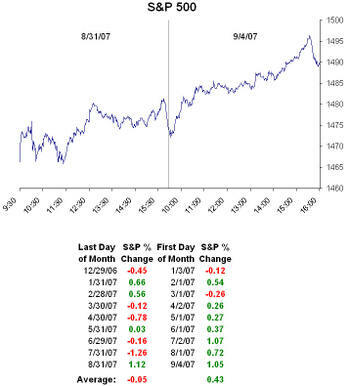 The S&P 500 has been more overbought than it currently is on 50 other days in the last 200 days of trading. Below we revisit an old favorite. The chart highlights changes in international equity indices since the start of the bull market in the MSCI World index (3/12/03). 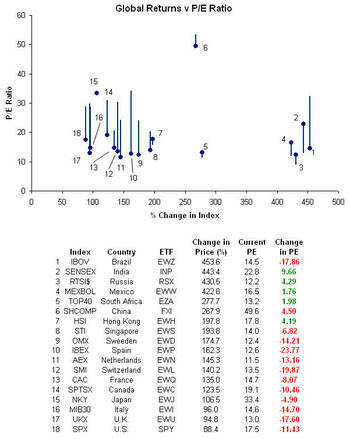 Brazil has performed the best, China has the highest P/E ratio, India has seen the largest increase in its P/E, and Spain has seen the largest decrease in its P/E. The Birinyi monthly newsletter, Reminiscences, will be published this Wednesday (it is always published on the last Wednesday of the month). In addition to Laszlo Birinyi's personal market commentary and broad market insight, we provide three equity portfolios based on different market strategies. While commentary and insight are interesting, $22.99/mo will also give readers access to the three portfolios which undergo small changes every month if necessary. 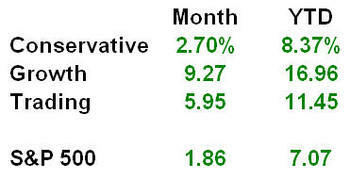 While we cannot disclose the portfolios, the performance through September 18th is shown below. This afternoon we note that the stocks that created this market's mess were down...all of them. The S&P 500 Financial index has 92 members. 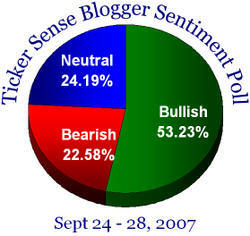 It carries a 20% weight in the S&P 500 index, Technology is the second largest at 16%. As of the close today every stock in the S&P Financial index was down. Most notably, Goldman Sachs, which beat its earnings estimate by 41%, closed down $1.97 after gaping up $5.44 at the open. Bear Stearns, which missed its earnings estimate by 35%, closed down only $0.18 after trading down over $4.00 on its report. Below are the best and worst stock in the Financial sector today (sorted on percent change). Oil's low close of $50.48 on January 18th, 2007 seems decades away as prices are up 62% since then. With T. Boone Pickens forecasting $100 oil (thankfully not this year), we looked back at historical price moves for the commodity since 1986. 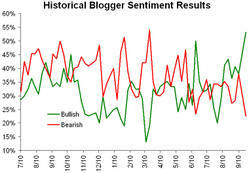 Bull and bear markets are defined as 20% moves. Based on this restraint, below we highlight the bull and bear markets for oil. 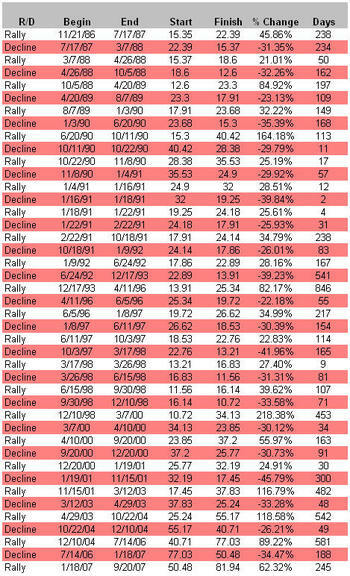 Notably, the average gain for oil in a bull market is 62.89% (we are up 62.32% right now); the average length of a bull market is 226 days (we are at 245 days right now). Yesterday we highlighted the light volume before the Fed's rate decision. Today we updated the same chart through the end of yesterday. 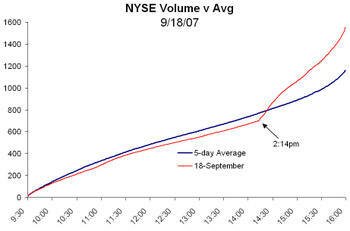 Volume on the NYSE finished at 1.65b shares, still nearly 100 million shares below the 50-day average of 1.73b shares.